In an interview with Racket Magazine in 2008, Sara discussed her feelings surrounding the mainstream music scene and the lack of ‘heart’ within it, perhaps explaining the motivation behind Heartthrob. Witnessing the duo performing at The Tivoli in Brisbane certainly proved to me that they had not forgotten their roots, with the sisters playing a sold-out set that jumped between folk-rock, acoustic ballads and synth pop. Even long before the support act Club Feet took to the stage The Tivoli was filled to capacity, and those hoping to nab a spot by the front of the stage in between acts were sorely disappointed. It was clear that no one was budging an inch just in case they missed a second of the show. A brief glimpse of Sara walking around backstage during Club Feet’s performance set the whole right hand side of the crowd into a sea of screams, and we stood with our eyes fixed, waiting as patiently as we could for the duo to start. Though it was hard to see at times (I’m not particularly blessed with tall genes), the frenzied screams around me revealed all I needed to know…the moment had arrived. Walking casually onto the stage in a lightning storm of purple lights, their silhouettes magnified against a giant prism bulging from the wall, Tegan and Sara opened the show with new hits Drove Me Wild and I’m Not Your Hero. In amongst electro beats and pulsing 80s hooks, Tegan and Sara’s unmistakable vocals cried out; echoing an ocean of beautifully crafted stories. Although starting the show with several new tracks, Tegan and Sara ensured we were treated to plenty of older material as well. Joking throughout the show, the girls teased us with promises of what was to come if we played our cards right. True to their word they didn’t keep the audience waiting long, unleashing hits like Back in Your Head, The Con and Arrow early in the set, sending their fans into frenzy of adoration. 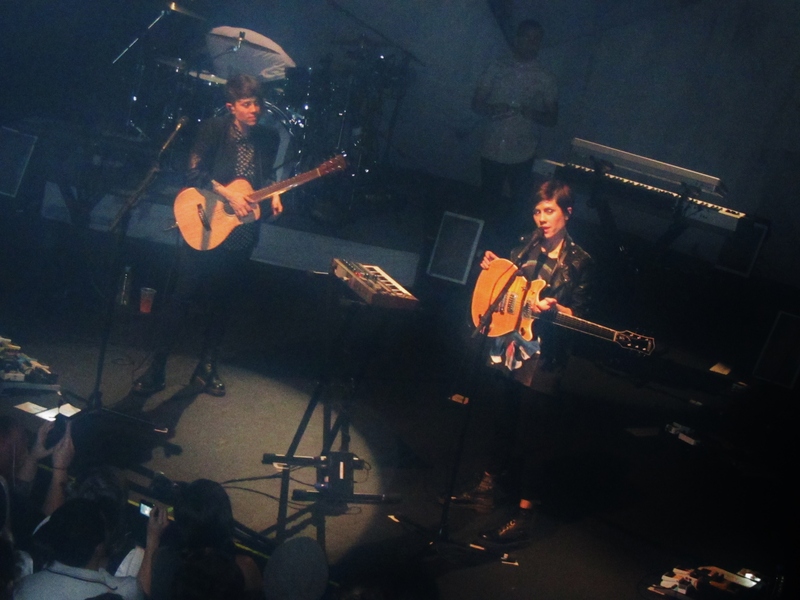 Many who have listened to Tegan and Sara over the years have described their music as having a special conversational quality. Spin Magazine once wrote, “Its strength remains in how much it feels like two people talking,” something which I can definitely relate to. The audience absolutely doted on every word they said, and I’ve rarely heard a crowd laugh louder than this one. The push and pull of their harmonies, their stories, is what makes their songs so likeable; and when the sisters weren’t singing they were busy talking to the crowd like old friends. Discussing everything from their love for Brisbane’s Fat Louie’s karaoke bar, to hilarious travel stories. there is always something to laugh along with at a Tegan and Sara show. The duo also talked Aussie culture, and poked fun at their new favourite Australian phrase. Although Tegan and Sara are well known for having a large following in the gay community, their show demonstrated to me just how powerful music can be in uniting people from all cultures and lifestyles. I was surrounded by both gay and straight couples, girly girls and tomboys, and in general people were just having a great time dancing, cuddling and enjoying music. I also had an amazing experience that proved just how selfless people can be. I had been struggling to take photos as there were a couple of really tall people in front of me, when all of a sudden a random girl wrapped her arms around me from behind and lifted me up! I then had a young gay couple lean over and offer me their spots by the front railing so I could take photos and enjoy some of the set without standing on my toes the whole time. I’m sure most would understand the magnitude of something like this…it just doesn’t happen! I was pretty blown away. [Girl 1] “This girl wants to know if she can stand in front of us”. I stood there incredulously. “Are you for real? Are you ACTUALLY being serious?” I asked. At this point, I thought the gigantors in front of me would probably smash my tiny face in with their ridiculous skyscraper high heels, so I sucked it up and stood sardined with the rest of the shorties. So yeah, the fact that someone would give up their spot for me, was something I felt worth mentioning! I had many music set favourites during the night, but one of the newer tracks I particularly loved was Shock to Your System. 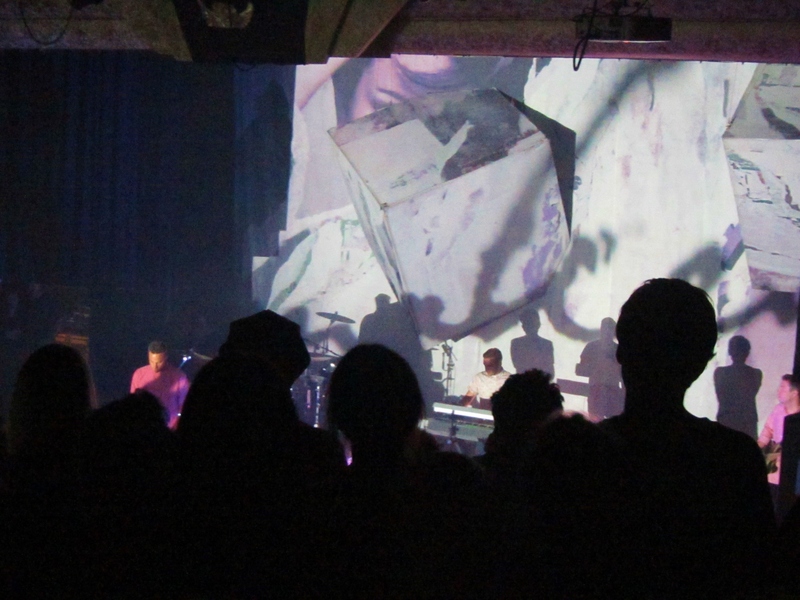 Listening to the song live had an entirely different feel from the record; I felt as though I were spinning in a forest of synth pop, disappearing into the piano, drums and juxtaposing vocal melodies. I loved the structure, the way you can close your eyes and disappear into Sarah’s wailing, her direct vocal style interspersed with Tegan’s gentle breathy ‘oohs’. This balance between gentle and overt strength is an important part of Tegan and Sara as artists, and it’s really interesting to see how the duo, who have such a visually strong appearance, express vulnerability. I love the vulnerability and honesty of their lyrics, the way they synthesize feelings of pain, longing and fresh beginnings. I find that their songs often have a youthful, sometimes even childlike quality; take for instance the song Alligator. The combination of simple xylophone notes, piano repetition and Sara’s almost ‘pouting’ vocal style makes me think of girlish emotion mixed with childlike phrasing. Closing my eyes and listening to their harmonies I feel wistful… a sea of emotions flooding back and opening a vault of both painful and happier times. Finishing the set with the dance anthem ‘Closer’, the girls waved their goodbyes, Tegan carrying with her a gift of Tim Tams. Of course, it wasn’t long before we all began screaming for an encore, and the girls soon returned to play an acoustic version of one of their most loved songs, Call It Off. As the familiar chords echoed throughout the room, the crowd gently began to sing. All around The Tivoli came the voices of women and men, paying tribute to these two amazing artists. Both Tegan and Sara were humbled by the experience, and to show their gratitude treated their fans to a medley of all their most loved songs, including We Didn’t Do It and On Directing. “We want to do this as a gift for you, because we can’t play them all”, said Tegan. Whether performing, conversing between each other or joking with the audience, the entire performance made me feel as though I had encountered something which was deeply intimate yet also comfortably casual. People were totally in love with Tegan and Sara, and I have to admit that after seeing them live, I too, am crushin’ more than ever! Previous The Beetle Bar Presents Earcandy #2!